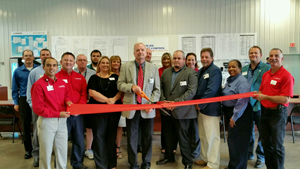 At a ribbon-cutting ceremony on June 30, Wil-Kil Pest Control unveiled the opening of its new training center in Chippewa Falls, Wis. The state-of-the-art facility, located at 4259 N. Prairie View Rd., features four full-size environmental “modules” designed to provide real-world experience before entering the field. The modules include the most common pest control sites: a kitchen, grocery store, hotel room and warehouse. The training facility also holds different types of pest control equipment to complete proper training and education. “We are very excited to offer our technicians a facility that allows for proper pest management training in different scenarios,” says Shane McCoy, director of quality and technical training for Wil-Kil Pest Control. Wil-Kil’s technician training also includes classroom time, online learning through Wil-Kil University, and on-the-job experience. 1 Comment on "Wil-Kil opens training center"
This is a great opportunity for the company and its techs. Every pest control company should follow suit. 100% for training, training, training!